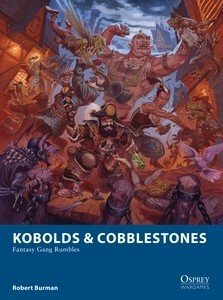 Kobolds & Cobblestones is a skirmish wargame for rumbles between gangs in the city of Ordinsport's seedy underbelly. Players hire gangs of criminals, thugs and enforcers from a number of classic Fantasy races, and attempt to take control of the underworld and establish themselves as the city's kingpins. Playing card-based mechanics and a cunning bribery element keep players on their toes, as a one-sided battle can turn around in a flash.